Beautiful and spacious Townhouse located close to slopes, ski village, and the town of Steamboat. Over 2600 square feet, it has more than enough room to fit your family comfortably. Living room with fireplace and TV, dining room, and modern kitchen. First floor has a wet bar, air hockey, and a large U shaped leather couch to watch your favorite movie in surround sound. Master bedroom has it's own balcony with views of the mountain. Large laundry room and mud room/ski storage round it out to make it a great place to stay during any season. * Prices include a $350 refundable security deposit. *** Free shuttle to/from slopes and to town! Also has an on sight manager to help you with whatever you need. Very clean and comfortable townhome for our family of 8. 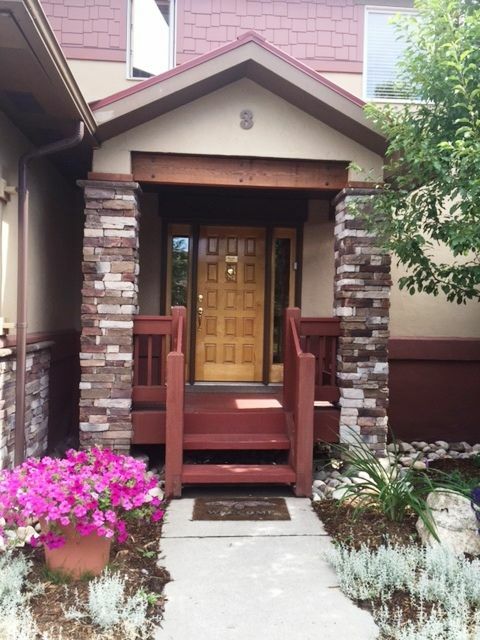 Very conveniently located within easy walking distance from Gondola Square. Would certainly stay there again. We were in Steamboat Springs for a week with another family and this place was perfect. There is a bedroom in the basement and a large common room where you can have the kids hang out while the adults can have their time in the family room on the main floor. Plenty of bedrooms and space. Location was great and the property owner was very reachable and friendly. Highly recommended! Great, spacious home with a really convenient shuttle service to the slopes. We loved that the kids could play on one floor while we relaxed with friends on another. Beds were comfortable, kitchen was well stocked, and everything was immaculate. It was great to have access to a dryer, too, to dry wet ski mittens and our swimsuits after we hit the hot springs. Our whole family had a great holiday stay. The layout of the home was perfect for children, teens and adults. The complimentary shuttle was a huge benefit providing quick and easy access to the slopes. Any additional needs or questions were met with prompt response by the Frank and his team. Loved Steamboat. Will def be back, prob not to this house though. Nice place. Close to a main road so it's extremely loud at night with the windows open. Make sure you ask for a specific list of what to do at checkout. Your deposit hinges on it. Scratch that, don't ask...just do what you think would be on a checkout list. First time in eight years being a VRBO member had to use a portion of the deposit for towels used to clean cars, baseball equipment,etc. Linens and sheets soiled and had to be replaced. I've been lucky with great renters for eight years and hoping for another eight! Place has been updated with all new linens/towels/hardwood floors. Let it snow! We had an outstanding Spring Break trip to Steamboat and our stay at this condo was a big part of it (the foot of new fresh powder helped too!). The condo is exactly as advertised and was very clean and well equipped. It was just the right amount of space for two families with six kids combined. It is walking distance to the gondola base and the frequent shuttles got us there and back in minutes every day. The shuttle service was also super convenient for getting to town and back for dinner. Frank is a great host and was extremely responsive to any questions we had. We will be back in future years!